Please refer to our stock # MLQ091304 when inquiring. Bottom neatly drilled, mouth-rim ground down (see pictures). Wood lid slightly chipped at the edges. 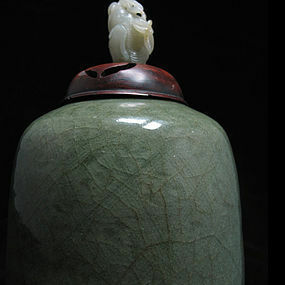 A sturdy and thickly potted mid to late Ming Longquan celadon vase, featuring a thickly glazed deep-green body and incised trellis diapers. Please note that this piece is quite heavy and weighs 4 lbs alone. This vase comes with a wood lid with a hardstone finial.